Art can be a beautiful thing. It has the potential to be transformative, both aesthetically and practically. This is possible because certain art has certain power. It has the power to change. It has the power to change someone’s mood on a cloudy day. It has the power to amuse someone when they are not feeling lighthearted. But, it also has the power to educate. It can be used to expose things that have long been hidden. 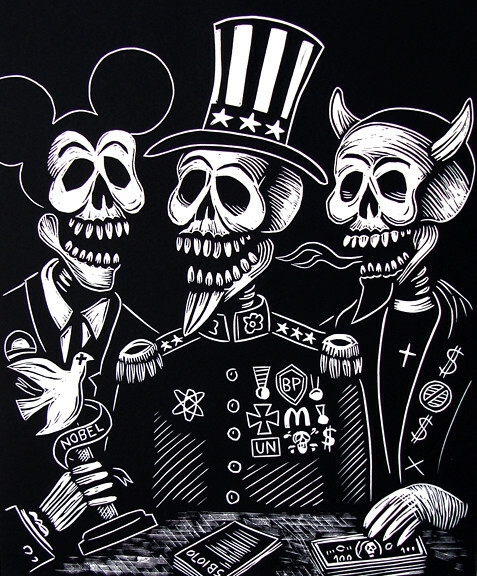 “Amigos de lo Ajeno” (Corrupt) Linocut by Carlos Barberena. Good art has the ability to change the generations. It has the power to change minds, hearts, and communities. In the hands of the right person, or right people, art can do all of these things and more. In the hands of politically conscious artists like Carlos Barberena and Seitu James Smith, art reaches its full potential to make a difference. In the hands of artists who are more concerned about their communities than capitalism, viewers are introduced to works and ideas that can help understand the moral and ethical values of diverse societies, and how these values contribute to the creation, change, and destruction of social structures. “The Refugees” after Larraz. 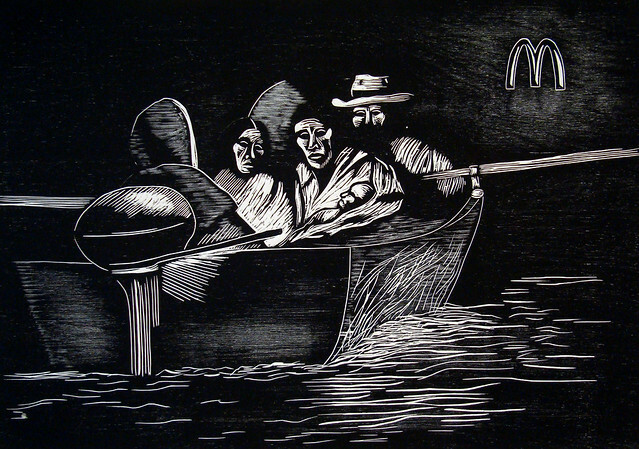 Woodcut by Carlos Barberena. Through his work, viewers are encouraged to make informed life decisions by being challenged to identify their own personal values and how they are developed. Are they developed in response to commercials and neatly packaged advertisements? Or are they formed by a conscious desire to contribute to something bigger than themselves. Viewers are then challenged to analyze the moral implications of choices they make based on the basis of these values. “El Niño y la Nube” after Amighetti. 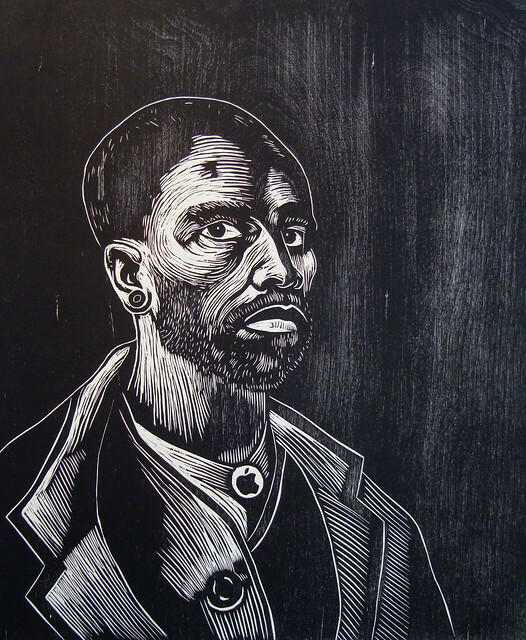 Woodcut by Carlos Barberena. Carlos says of his work, “With my work, I seek to be a vector of change, collecting images that pertain to our collective memory and that in certain form, make reference to painful events in the history of my country and of the world.” A world which, in spite of regular advances in technology and medicine, still reels from the affects of wars, as well as political and social disparities. When exposed to the works of Carlos, viewers are presented with a visual language that helps them understand key issues and concepts that are relevant to various marginalized groups (economic, racial, and social) which aim to empower the viewer to better understand, and eventually appreciate, those groups. Viewers are inherently challenged to compare and contrast their own economic, racial, social, and cultural practices and consider how these practices have historically affected these previously identified groups. 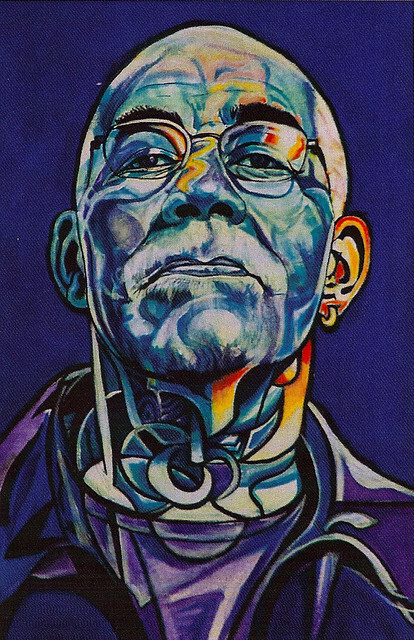 “Monk” Painting by Seitu Smith. Seitu’s work is a reflection of his faith, knowledge, and life experience, both positive and negative. His work shows a personal commitment to engaging and challenging the world to be honest in how it sees itself. 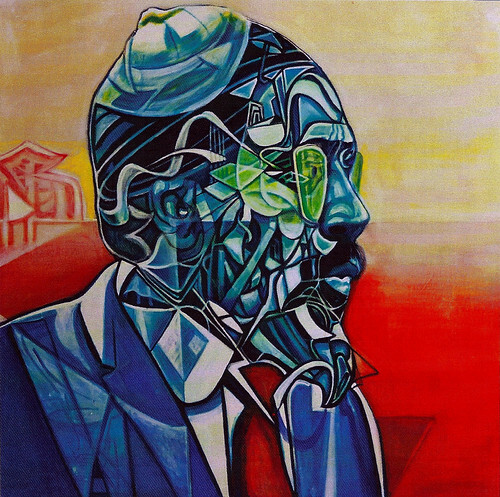 Seitu, a highly regarded painter who resides in St. Louis, presents works that address ideas and issues of inequality between communities; privilege versus poverty; natural versus unnatural; and spiritual versus physical. 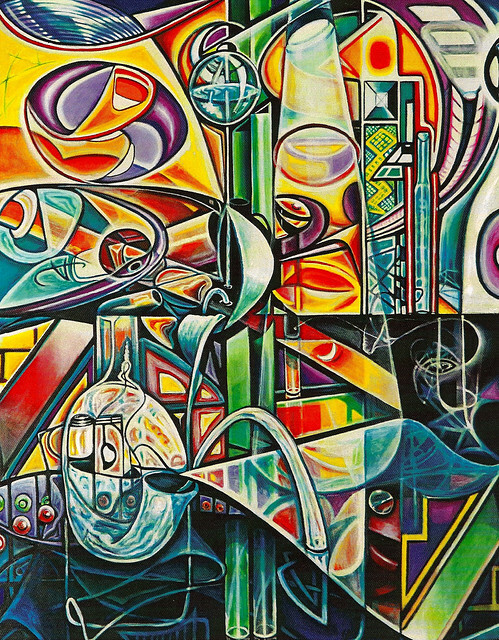 “The Magic City” Painting by Seitu Smith. In the hands of capable artists like Carlos and Seitu, there is not question as to whether art can be used as a valid tool for political, racial, and social expression. In the world created by Carlos and Seitu, viewers are challenged to address their own assumptions about class and race. Viewers are challenged to acknowledge and address the impact that their assumptions and decisions relating to class and race have on them and those around them. They are challenged to identify and acknowledge conflicts between their value systems and their surrounding community. “Self-Portrait after Van Gogh”. 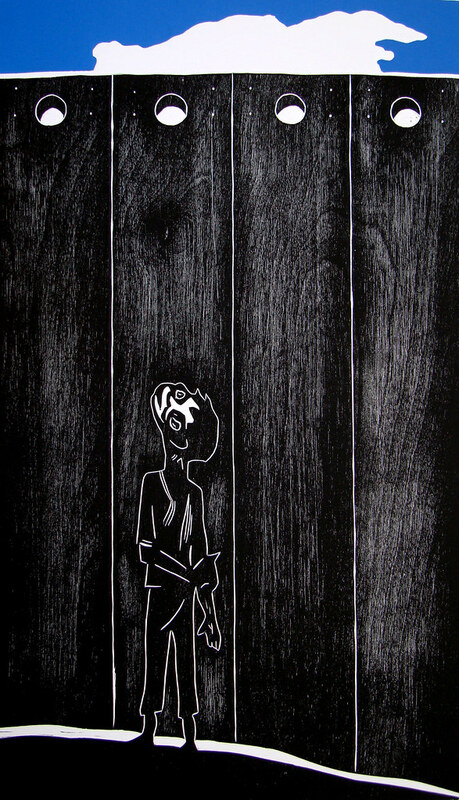 Woodcut by Carlos Barberena. Najjar Abdul-Musawwir, Associate Professor of Art at Southern Illinois University at Carbondale, once said, “I am not interested in telling a story of oppression, but a story of being, contributing, and building with…powerful wisdom…” In their own ways Carlos and Seitu both hold to the same sentiment. They create work that acknowledges the struggle of those who fight against oppression, through wisdom and inner strength, to build better lives for themselves and future generations, wherever they may be living. That is the power of good art. 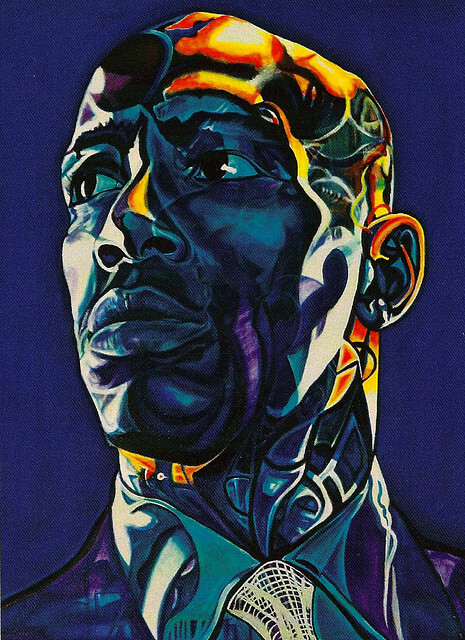 “60 Minutes Man” Painting by Seitu Smith.